She begins by completely misunderstanding the significance of Jesus on the cross. Miller writes, “The Christian Lord allowed himself to be crucified rather than fight the injustice of the death sentence imposed on him.” To co–opt Mark Twain; this is an inability to distinguish between lightning and the lightning bug. Consequently, Christ was not the earliest recruit for the left’s anti–capitol punishment movement. Christ died for our sins. He willingly paid the price we could not pay and ushered in the New Covenant. There would be no Christians without Christ’s death on the cross. Even if the Jerusalem chapter of the Innocence Project had tried to get Him off the hook, He would have refused the offer, because to do so would have rendered His work pointless. Then it left me wondering if I had missed a recent development on the violence front, so I did an online search on “strike AND cheek AND gunfight” to see if there had been a rash of concealed carry permit holders (CCW) lighting up people who slapped them. That search string was a bust, so I tried “strike AND cheek AND shoot” with the same result. 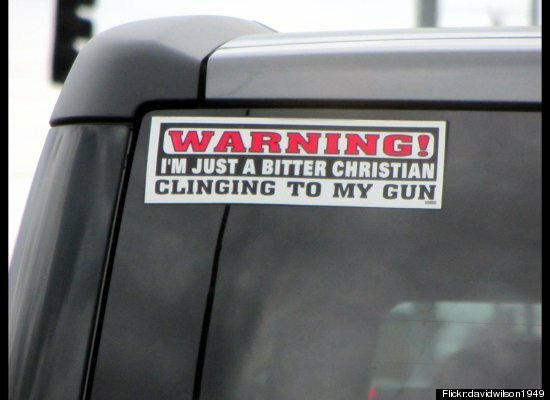 Evidently there is no problem with Christian gun owners initiating violence. Miller’s goal appears to involve persuading Christians to join the ranks of the defenseless. This decision, however, would not be made in a vacuum. Should a Christian head of household decide to disarm because he believes guns are inherently evil, like cigarettes or 16 oz. sodas, his decision would not affect him alone. His wife, his children and mom in the basement would all instantly become draftees in the War for Pacifism. And the family would be misguided draftees at that. As Adam Clarke points out in his commentary on the passage, these “exhortations belong to those principally who are persecuted for righteousness’ sake.” Say for example, an orthodox Christian that leftists like Miller slap up the side of the head for refusing to support homosexual marriage. Following Matthew, the Christian would turn the other cheek as he said he does not approve of the homosexual lifestyle either. Then Miller snidely intimates that “conservative Christian leaders are not falling over themselves to proclaim in public their pro–gun theologies.” But then Miller proceeds to list various Christians who are doing just that. Wrong again. Jesus praised a Roman centurion who controlled his own sword and 90 others — for his faith, saying, “Truly I tell you, I have not found anyone in Israel with such great faith.” What’s more, Jesus reached out to the weak and the victims, but unlike leftist community organizers, He considered Himself a shepherd and the shepherd doesn’t hand the wolf a napkin as he approaches the herd. Miller would do more to protect the innocent life of children if she would worry less about the imaginary threat of “assault weapons” in the hands of Christians and more about the real threat of “assault doctors*” who are responsible for the deaths of over 1 million innocents each year during abortions. *Thanks to my wife, Janet, for this inspired term that aptly describes a depraved occupation. This entry was posted in 2nd Amendment, Christianity, Culture Wars, Humor, Mainstream Media and tagged 2nd Amendment, abortion, assault weapons, Christ, Christian, David French, Gospel, gun rights, Jesus, leftists, liberals, Lisa Miller, pacifists, pro-life, religion, Richard Land, self-defense, Southern Baptist, theology, Washington Post by michaelshannon. Bookmark the permalink. As always, enjoyed your article. Your last paragraph concerning abortion is right on about how these drs end the lives ( to me it is murder) of all these innocent babies. Somehow, these Pro-Choice advocates don’t care. The existence of species that our society protects, such as certain animals, so they do not become extinct have a greater chance of surviving than the unborn. However, I feel the women who allows their unborn child to be aborted is just as guilty as the drs. They feel it is their right, but it is not a God-given right.